Serve this flavorful, healthy dinner with lots of crusty bread. Place potatoes and 1/2 cup of chicken broth in a large non-stick skillet. Bring to a boil over high heat. Cover; reduce heat to low and simmer for 10 minutes or until potatoes are just tender. Remove potatoes from skillet and set aside. Melt butter in same skillet over medium heat. Add chicken; cook for 6 minutes, turning once, or until lightly browned but not completely cooked. Add partially cooked potatoes, green beans, remaining 1/2 cup chicken broth, rosemary, and pepper to chicken. Bring to a boil over high heat. Cover; reduce heat to low and simmer for 10 minutes or until potatoes and beans are tender, chicken is thoroughly cooked and internal temperature is 170°F. 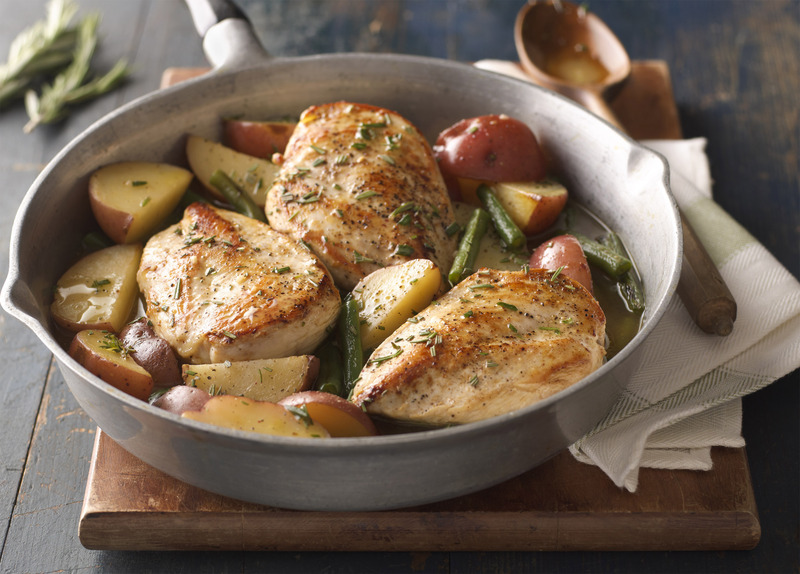 Serve chicken with potatoes, green beans, and pan juices.